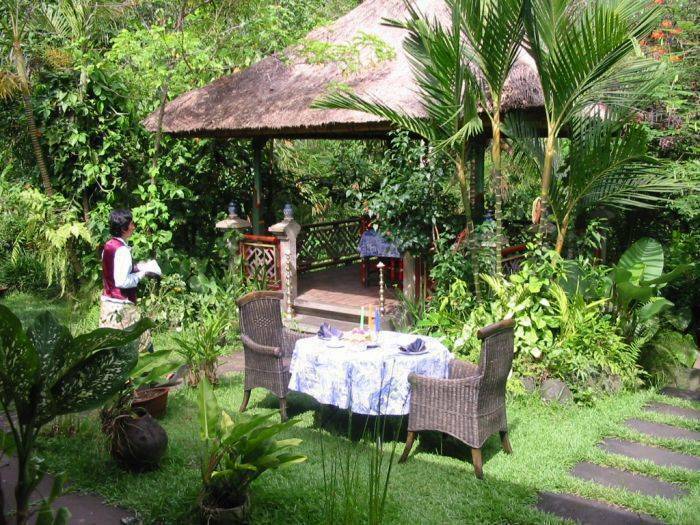 Matahari Cottage Bed & Breakfast is situated on a secluded ravine, only a seven minute walk from Ubud Palace. Numerous birds and butterflies weave through the surrounding lush green jungle and garden of colorful, exotic flowers. 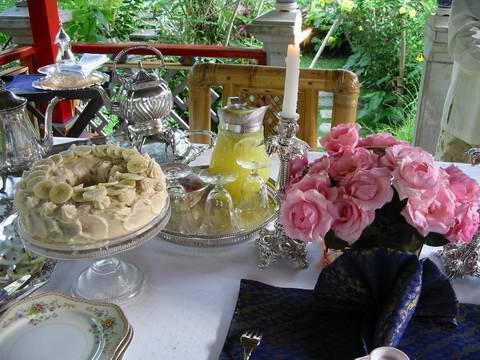 Matahari Cottage Bed & Breakfast offers a five-star quality breakfast and an exquisite afternoon tea free to in-room guests. Many utensils at Matahari are antique porcelain and silverware, courtesy of our master innkeeper, who enjoys sharing his Bali lifestyle with his guests. 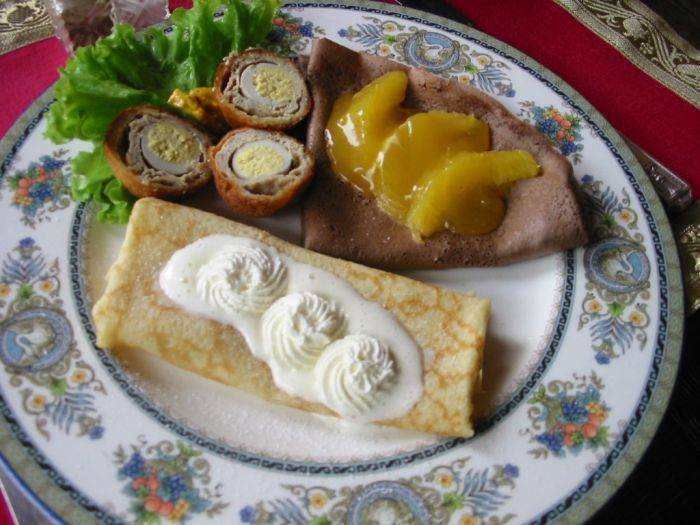 Our breakfast menu is changed daily to satisfy all palates. B. Use of the cold water Jacuzzi and air-conditioned Elizabethan library. C. Fresh flower in your room and evening aroma oil service. D. One free bottle of mineral water per guest per day. Wireless Internet is available at no charge. Airport transfer can be arranged at 22$US per car per trip. 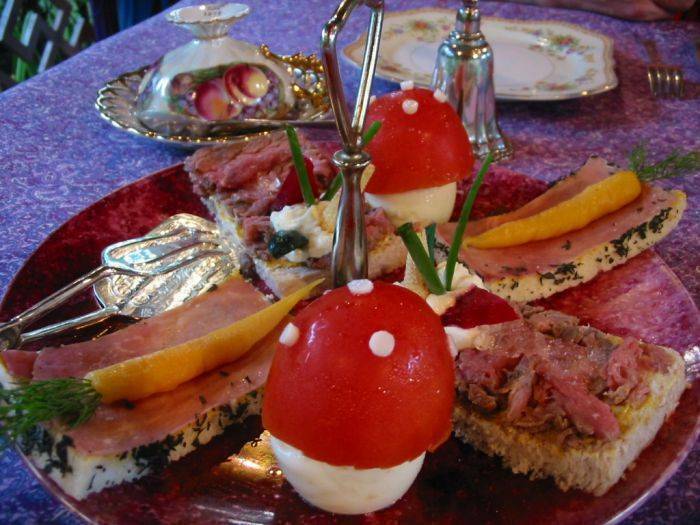 Complimentary daily breakfast and afternoon tea. Jungle Jacuzzi and air-conditioned library. Barong Cottage: Singa (a winged lion in Hindu mythology) in the shower room, and the Barong (a strange, fun-loving creature in the shape of a shaggy semi-lion, representing the good spirit in Hindu mythology) bathtub set the mood of the Barong Room. The stone carved Singa was handpicked from the wares of forty stores in a famous stone-carving village called Negari near Ubud. Hot water will spout from the Singa's mouth. The Barong was hand-carved on site. The whole bathing area is located in an outdoor garden, which gives you a feeling of breathing with the Universe while bathing. The interior decoration is traditional Balinese style. The bedcover and curtains are the best found at the most famous cloth street called Sulawesi in Bali. Primitive Room (air-conditioned): The primitive room is located in the most tranquil corner of Matahari, its two windows facing a tropical jungle and a lush green gardng by a Balinese artist named Dewa covers the entire main wall and lends a feeling of sitting in an overgrown jungle. The Timor pandok (a wooden primitive bed) and the aboriginal decoration motifs from Borneo complete the room's primitive atmosphere. Cinnabar Tearoom: The design of this room was inspired by the Samurai golden tearoom in the Osaka castle in Japan. The Cinnabar Tearoom is a refined Japanese room. There is a main beroom with a double bed and a tearoom with a double futon oferten converted to a second bedroom upon rewuest. The two traditional Japanese Ukiyo-e paintings of a landscape and a Japanese geisha are more than one hundred years old. Lacquer-ware from Japan and China is displayed in a cabinet. In addition to tatamis, a black mattress is provided for comfort. A Japanese Zen garden of fine stones separates the room and bath, which is fenced by black bamboo and features a big round wooden bathtub. The porch floor is from a wall of teak wood from an old Javanese house which the owner tore down for renovation. The faded scratches and marks on the wood further enhance the shabby chic decor of a classical Japanese room. Indian Pasha Room: The lordly presentation of an Indian Pasha is represented by the velvet-covered double platform bed. Large velvet pillows with silver tassels manifest the essence of decadent Indian luxury. A painting in an ornate wooden frame, depicts the thriving era of the Indian Mogul dynasty. It was painted by the Dutch traveler Vanden Grooten in the 18th century and later etched for publishing. A day bed scattered with embroidered classical Indian pillows is placed on the porch. With the cool wind blowing from the jungle, one could easily fall into a serene sleep and forget space and time. Batavia Dacha Cottage: Batavia was the name of Jakarta during the Dutch colonial period in Indonesia. 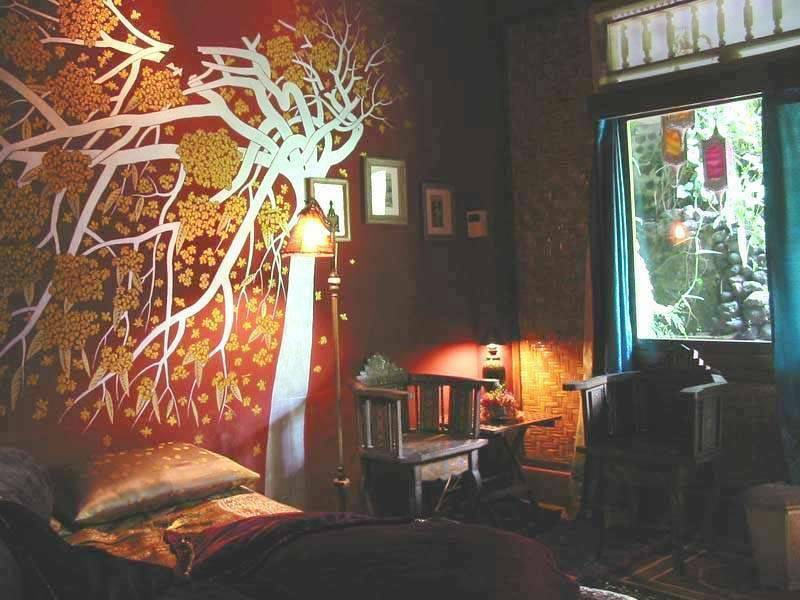 The room design is based on colonial Javanese style. The centerpiece is an eighty-year-old solid brass bed with a white cloth drape streaming from a corona bed decoration above like a princess crown. Romantic ambience permeates every corner of the room. Rose gardens blossom on two sides by the porch. The sidewall extending to two glass windows under the sidewall gable gives the feeling of the high ceiling in a chapel. The name Batavia Princess depicts the room well. South Paific Room: This room, designed for backpackers, features Balinese simplicity. A standard bathtub is provided for guests' comfort. 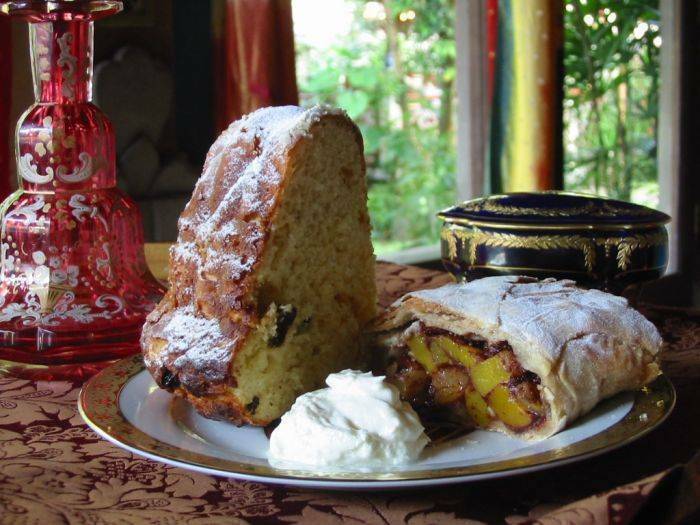 Matahari Cottage Bed and Breakfast is surrounded by lots of gourmet restaurants, day spas, painting gallaries, and souvenir botiques. The Ubud staple Andalan Organic Grocer is only 1 minute walk form us. No charge: Cancelled or changed at least on week before the scheduled arrival. Half-day room rate of the first night stay: Cancelled or changed between one week and one day prior to the scheduled arrival. One-day room rate of the first night stay: Cancelled or changed less than one day prior to the scheduled arrival. However, if we are able to re-sell the room that you cancel or change, we will be able to refund your whole deposit. Located on Jalan Jembawan near Ubud Post Office and Bali Buddha Restaurant/Andanlan Organic Grocery Store, Matahari Cottage Bed and Breakfast is only a shot 7 minute walk eastward from Ubud Palce. Airport transfer is availabe at 22$ per car per trip. For airport pickup service reservations with Matahari's driver, simply drop us a note with your flight information in it including your flight number and exact arrival date and time. Our driver will be waiting for you with your name when you come out of Customs. We will only need your flight number and the arrival time to confirm the service. Shuttle bus availabe outside the airport. It usually takes up to three hours to Ubud because many stops/transfers. Nearest airport: Ngura Rai International Airport (Denpasar), approx 30 kilometers from Ubud.